We were greeted by Tarik upon arrival who carried our suitcase and showed us around the apartment. We were allocated a 3 bedroom apartment when there was only 2 so we had plenty of space. The apartment was spotlessly clean and I cannot find any fault, the view from the rooftop terrace is wonderful, in front you have the sea and behind views of the mountains. The apartment is only a short walk from Puerto and very close to the Loro Parque. We stayed a week in October. We were looking for a relatively inexpensive, simple property in a quiet, non-touristy location, with quick easy access to the beach. What we found met all our expectations. The neighbourhood is quiet and being a cul de sac traffic is not a problem. Exploring on foot the narrow streets around is fun, there are excellent views to the sea. There are a few fish restaurants very close by, but only a small shop to buy food. For most things inlcuding fresh milk one has to go to a supermarket, the closest is Lidl (not convenient on foot, use a bus or better a car). Overall I would say a car is necessary to be comfortable in this house, as most things apart from the beach are not nearby. Parking on the street has never been a problem. Inside the house is simple, but clean and cool thanks to the constant air flow. It contains basic kitchen facilities but people wanting to prepare regularly full meals will struggle, especially due to the presence of only a small electric hob and no microwave (there is an electric oven/grill that we did not use). Toaster and coffee machine (of the filter kind) for breakfast work well. The bathroom is small but works well. The bedrooms are surprisingly large given the small apartment, I liked them. Overall I think the house works well for a small family, but I would struggle if all the five beds available were occupied. A very well kept Canarian style property divided into apartments with a lovely roof terrace. The owner of the apartments was at the property to meet us, making sure everything was to our liking. A bowl of fruit, bottle of bubbly, together with basics in the fridge. Very well equipped and nothing is too much trouble. Has good knowledge of the area and well spoken English. Punta Brava is a 10 - 15 minute easy walk into the centre of Peurto de la Cruz, either along the sea front or the road. You are only 2 minutes from the beaches. Some small supermarkets for every day needs, and several restaurants. Would recommend it as a great alternative to the high rise hotels of Peurto de la Cruz. We stayed for 3weeks and had a fantastic relaxing time. We have just returned from a wonderful stay at Casa Rosamar in Punta Brava, Puerto de la Cruz. We stayed in the apartment opening onto the roof terrace, with a beautiful view and everything we needed inside, and the very friendly owner helped us out when help was needed. Just around the corner is the beautiful Playa Jardín. Walking the boulevard along this beach you'll arrive in the center of Puerto de la Cruz in about 15 minutes. We hope to return here one day! Tarik war ein sehr guter Gastgeber. Hat sich gut um die Organisation gekümmert. Das Appartement war wie beschrieben und sehr schön. Muy buena ubicación, zona tranquila y con espacios para aparcar. El apartamento es acogedor y bien situado. Una terraza muy agradable. Punta Brava, the 'wild point“, is a rocky spit of land marking one end of a black lava-sand beach (Playa Jardin), while on the other end you have the city centre of Puerto de la Cruz, the second-biggest town in the North of Tenerife. The 'barrio’ of Punta Brava is a Spanish quarter at the outskirts of Puerto with a nice little plaza, small restaurants and pubs, shops and more. Looking out from the sun roof of Casa Rosamar you have on one side the Teide, the holy mountain of the Guanchos, the original inhabitants of the Canaries (with 3711 metres Spain’s highest mountain), and on the other side the sea and the skyline of Puerto de la Cruz. The Sea is actually just 30 metres away, the beach to be reached in 2 to 3 minutes by foot. 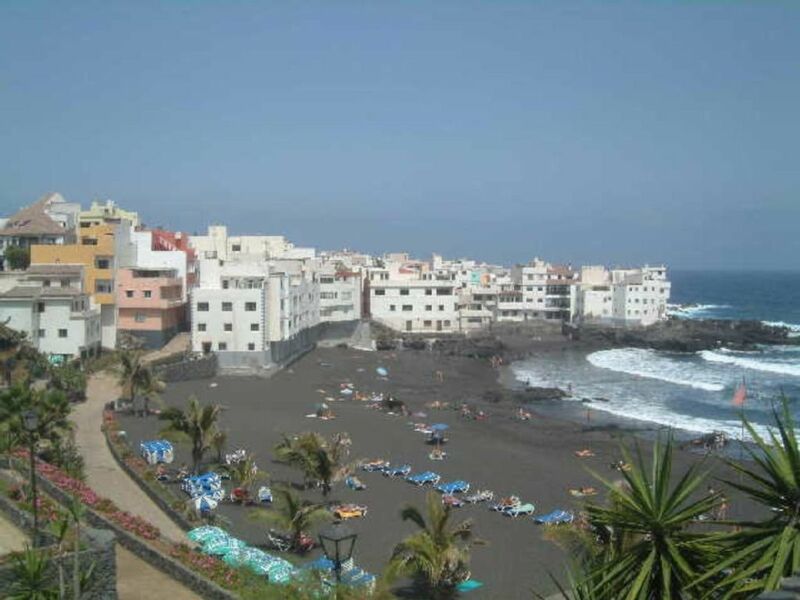 A 20 minutes walk along Playa Jardin beach takes you to the city centre of Puerto de la Cruz a buzzling town with pubs, discos, theatres, concerts and so on. Die Preise sind nach Apartmentgrösse, Aufenthaltsdauer, und Anzahl der Gäste gestaffelt. Ab 3 Wochen gelten unsere günstigen Monatspreise.